Processing XML documents in multi-user database management environments requires a suitable storage model of XML data, support of typical XML document processing (XDP) interfaces, and concurrency control (CC) mechanisms tailored to the XML data model. 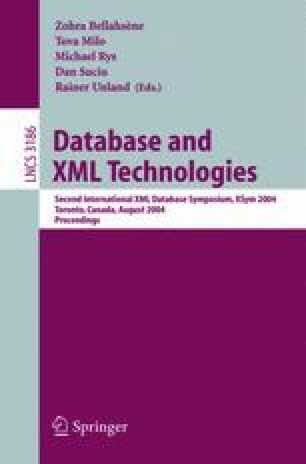 In this paper, we sketch the architecture and interfaces of our prototype native XML database management system which can be connected to any existing relational DBMS and provides for declarative and navigational data access of concurrent transactions. We describe the fine-grained CC mechanisms implemented in our system and give a first impression of the so achieved benefits for concurrent transaction processing in native XML database management systems. By mistake the printed version of this paper shows the same figures for Fig. 10 and Fig. 11. This was corrected in the online version.